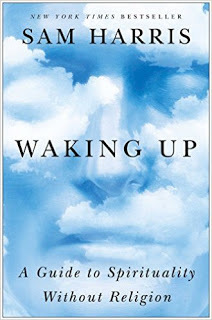 I approached Sam Harris' Waking Up: A Guide to Spirituality Without Religion with some advance resistance, knowing its author's reputation as something of a crusader (forgive the term!) against all religions. Even though I share his skepticism about conventional religion, I'm not enough of a rationalist to inveigh against the faith(s) that many of my fellow humans embrace, and I'm certainly no scientist. Ken McLeod's A Trackless Path, has been my own most recent preoccupation. So it surprised me to find this book by Sam Harris so helpful in my own search for a deeper meaning in life; and I was more surprised still to discover, halfway through, that Harris's path had led him to the study and practice of Dzogchen Buddhism -- into which, thanks in good part to McLeod's book, I have been delving in my meditation practice. Starting from the premise that "The feeling that we call 'I' is an illusion," Harris launches first into an investigation of "spirituality," which he defines simply as "a clearer understanding of the way things are." "Deepening that understanding," he continues, "and repeatedly cutting through the illusion of the self, is what is meant by 'spirituality' in this book. Confusion and suffering may be our birthright, but wisdom and happiness are available." No Buddhist, surely, would quarrel with that premise. Still, Harris reclaims from the traditional religions the right -- no, the duty -- to understand the spiritual "in the context of neuroscience, psychology, and related fields." In other words, through the lens of human reason and established science. Although science may ultimately show us how to truly maximize human well-being, it may still fail to dispel the fundamental mystery of being itself [which] doesn't leave much scope for conventional religious beliefs, but [...] does offer a deep foundation for a contemplative life. Many truths about ourselves will be discovered in consciousness directly or not discovered at all. the selflessness of consciousness, the practice of meditation becomes just a means of getting more familiar with it. The goal, thereafter, is to cease to overlook what is already the case. Paradoxically, this still requires discipline, and setting aside time for meditation is indispensable. But the true discipline is to remain committed, throughout the whole of one's life, to waking up from the dream of the self. We need not take anything on faith to do this. "Your mind will determine the quality of your life," writes Harris in his "Conclusion," describing what I tend to think of as the little mind as being "as contingent as the body," defined and limited by all that personal stuff we carry around with us. The bigger, indeed limitless, mind, is consciousness, which Harris says "appears to have no form at all, because anything that would give it form must arise within the field of consciousness. Consciousness is simply the light by which the contours of mind and body are known." Call it light, call it pure, limitless space, or spaciousness, consciousness "is never improved or harmed by what it knows. Making this discovery, again and again, is the basis of the spiritual life." In the end, Harris rejects what he calls "the deflationary attitude toward consciousness" of many who toe the rationalist, scientific line: "A middle path exists," he writes, "between making religion out of spiritual life and having no spiritual life at all." Where many see nothing but conflict between science and religion, Harris sees the opportunity -- the necessity, really -- of investigating that aspect of the human experience that transcends what can be understood and explained in purely rational terms. Recognizing, with skeptical discrimination, the value of guides to spiritual experience -- including right-minded teachers and even powerful, mind-expanding drugs -- he brings it all back to the personal responsibility of each of us, if we are to live our lives to their fullest potential. It's gratifying, to this reader at least, that he finds in meditation the most precise and powerful of tools to achieve this goal. Be it said, too, that this is an immensely readable and enjoyable book. Harris writes about the profound issues that affect our lives with clarity, and with occasional humor at the expense of the pompous, the pretentious, and the fraudulent peddlers of the spirituality he seeks to rescue from their clutches. Honoring, above all, intellectual honesty, Harris models it in his writing, and this is what makes him a pleasure to read.